The Virgin Queen Elizabeth !, said on her death bed, ‘I would give all my worldly possessions, for one more precious moment of life’. A sentiment that came to mind at Melbourne yesterday evening. After a titanic struggle with Rafael Nadal. Roger Federer secured his eighteenth Grand Slam. As the umpire called game, set and match, Roger looked joyous. moved, disbelieving, euphoric and all other emotional points north of happy! 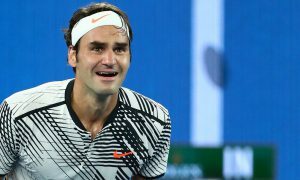 When you have been a great champion, you wonder if you will ever experience one of those special Sunday Grand Slam moments, ever again. Could you, for one special fortnight, prove yourself again against the best the game has to offer? Yet, really you are not testing yourself against the rest. You are testing yourself against yourself. Can you connect to the magic one more time? Can you find those reserves of special energy, that allow you to raise your game when you are under the cosh in a five-set thriller? These are the moments that you live for… when you and the game are as one. It’s the thing that makes you feel most alive! It’s way beyond everyday life. To have one more moment with the tennis Gods…well it’s enough to make a champion cry. For when you are still dedicated to high levels of excellence…when you love the game as much as you ever did… when you still have the hunger to achieve…then why would the Gods desert one of their own!